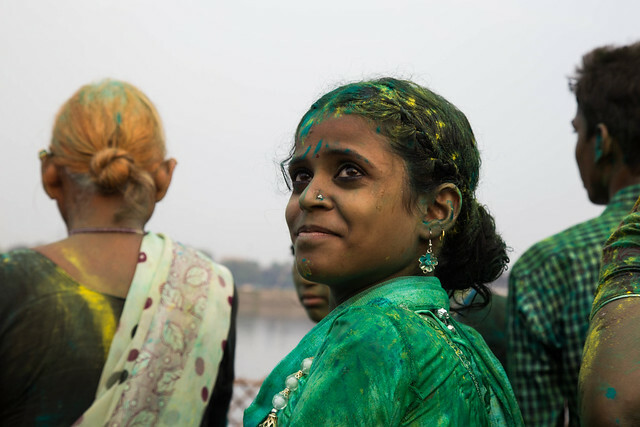 Someday I may tell our youngest child about the day I stood, 6 months pregnant, ankle-deep in Yamuna mud with neon yellow paint powder smeared across my cheeks, surrounded by saris swirling to a trance-inducing drumbeat. I may or may not tell them about the heavy river air, so thick with a mix of industrial pollution, incense and marijuana that, by the time I returned to our car, my throat ached and my head buzzed. 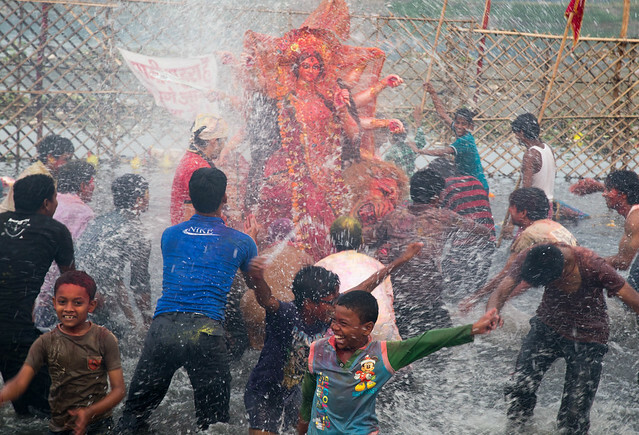 I came to the river to see the Durga Puja, take photos and, as I realized after the fact, to feel firmly planted in India for a little while. As an expat and a mother, I often go about my daily life in spite of India rather than in any real harmony with the country. I wait out traffic jams with my smart phone, scrolling through American newspapers and design blogs. I scour markets for the East Asian ingredients that my family craves even though it would probably be far easier and cheaper to eat Indian food every night. Before I got pregnant, I wore jeans and sweated my thighs off in 110 degree temperatures rather than trade my Western wear for the billowy cool comfort of a salwar kameez (these days though, I’m living in salwars–best maternity pants EVER). I love India and if we could stay here longer, I think we would. But without the option of settling down here–or anywhere–for the long haul, we still cling to those meals, newspapers and favorite jeans that make us feel most like ourselves even as every other aspect of our lives changes on a two to three year schedule. 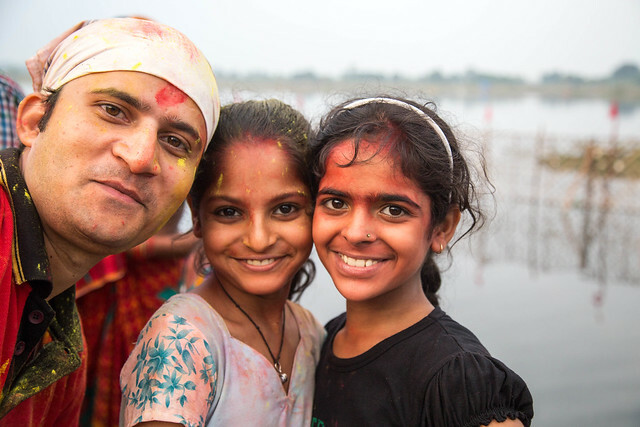 We move, we adapt, we supplement cherished family traditions with new favorites from wherever we live; but we certainly don’t wake up every morning aiming for the most authentically Indian experience we can find. The downside to this middle way though is that, somedays, in trying to carry out the same routines that we would “at home,” we set ourselves up to experience only the less-than-thrilling aspects of life here, rather than any of the things that make India beautiful in it’s own intoxicating way. 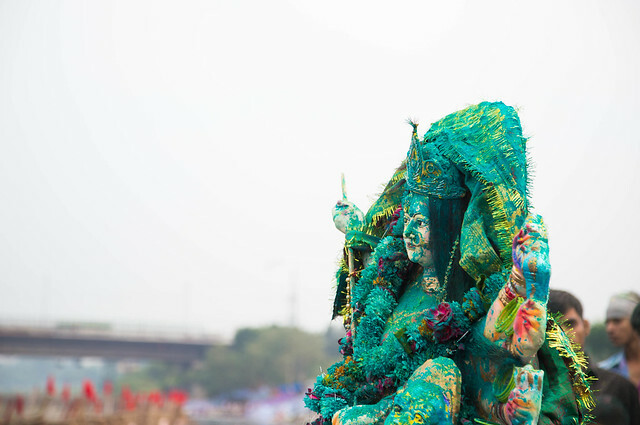 Hence, the need for yesterday’s pilgrimage down to the Yamuna to watch Delhi’s version of the Durga Puja. 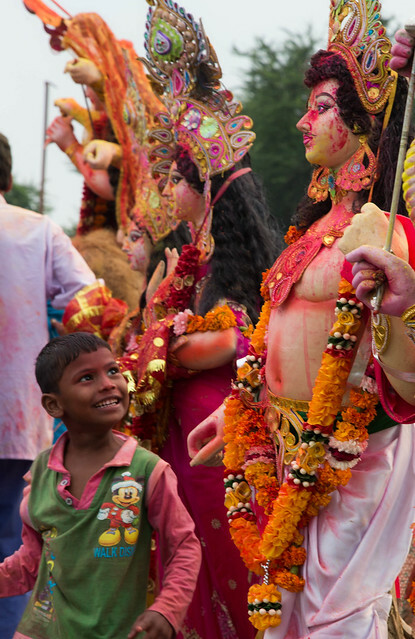 The Durga Puja is one of several major Puja festivities throughout the year but it’s not as robustly celebrated here as it is in Calcutta and I wasn’t sure exactly what to expect. Picture the wide, inky black Yamuna. Smoke stacks stand sentry in the distance and a massive pipeline, at least 4 feet in diameter, divides the grassy river embankment along the river from the Tibetan refugee area and the highway running parallel on the other side. 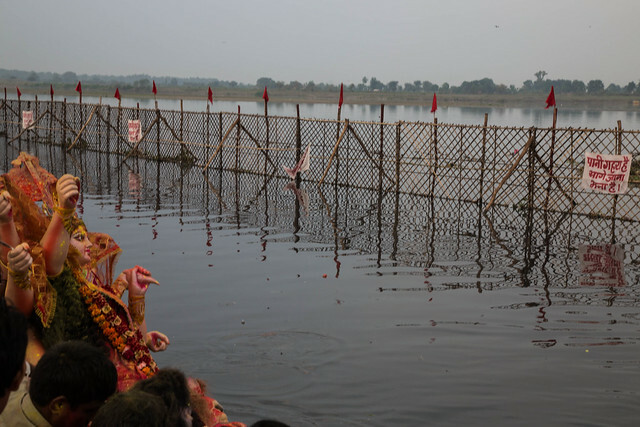 In the water stands a bamboo fence with bright red flags, perhaps to keep revelers from wading out too far and drowning. A boat filled with khaki and canes idles just on the other side. As the sun sets, giant orange trucks begin to bump and slide through the tall grass. 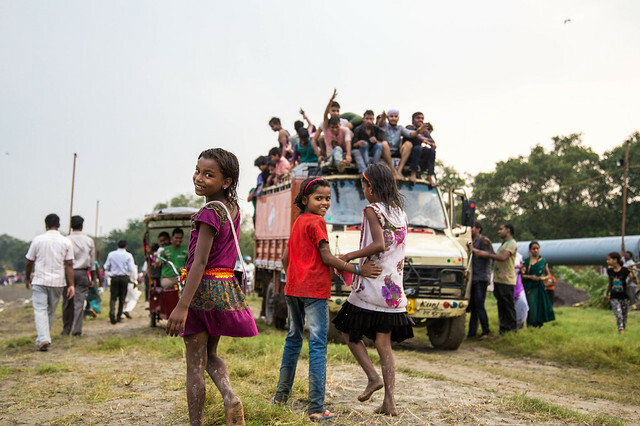 Their wheels spin in the fresh mud from an unexpected afternoon storm as dozens of people sing and dance and fall into one another in the open truck beds. 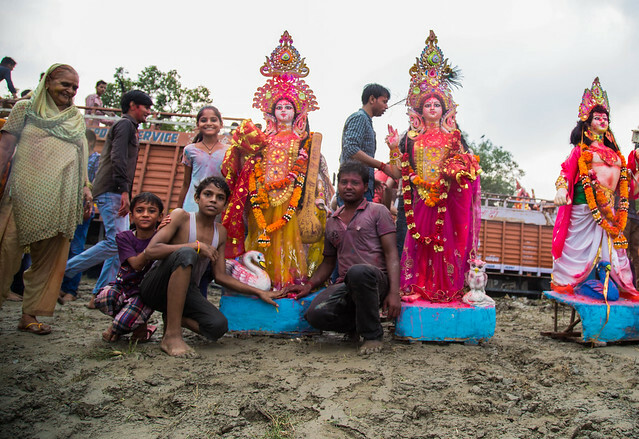 The trucks lurch to a stop and families, friends and whole neighborhoods jump down carrying huge plaster of paris Durga idols painted in bright shades of red and pink. Some of the celebrants are solemn and sober, others loud and boisterous. A group of drunken young men in identical gold fringe headdresses dance in a circle to giant drums playing a heart-racing beat. 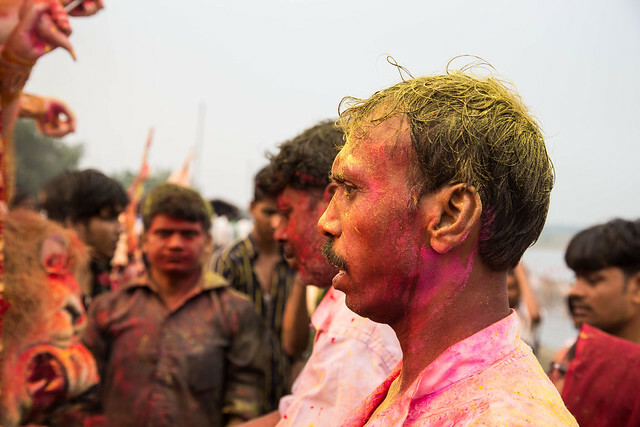 Prayers are offered, songs sung, incense lit, holi paint powder is thrown into the air. Eventually, sometimes after just a few minutes, sometimes after an hour, the whole group carries its idols down the slippery slope to the water’s edge and then into the murky knee-deep water. 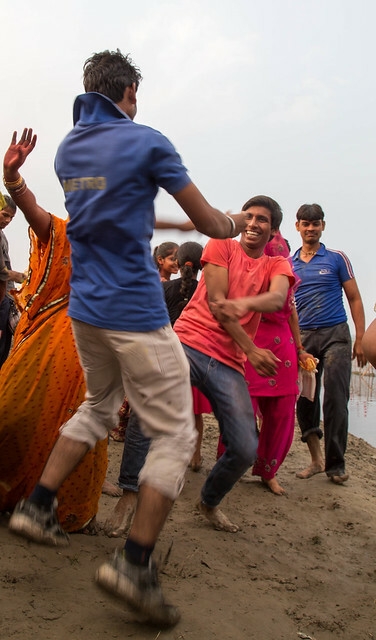 More prayers, some family photos and then–for the most enthusiastic of families–a giant splash fest to soak everyone close enough to receive the spray of the Yamuna’s blessed waters. I had made arrangements to go to the Durga Puja on my own, but ended up going instead in the company of a good friend who claimed he just wanted to get some good shots for his wire service but who eventually admitted he wasn’t really sure it was safe for me to go alone. To blend in, I wore the baggiest kurta I could find and a pair of running shoes that may never recover from the experience. But I am no photojournalist. I don’t blend in nor am I capable of any kind of professional distance. 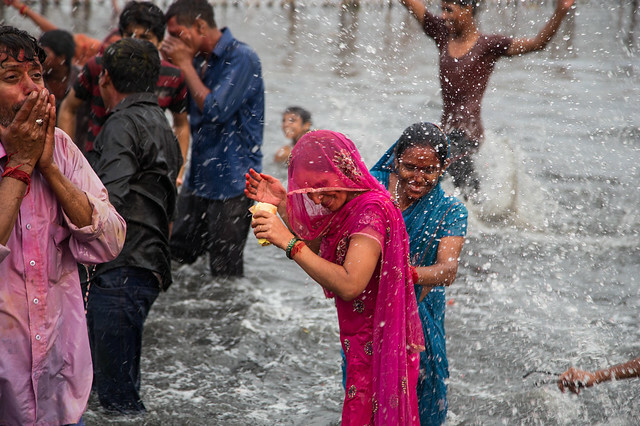 Within a few minutes of reaching the river bank I was swarmed—but not by the drunken louts my friend warned me about–instead by dozens of women wanting to talk and shake hands and take pictures. In my daily life, outside our tiny circle of well-off Indian friends and our expat bubble, I rarely interact with Indian women. In China, I chatted every day with women market vendors and young restaurant waitresses and grandmothers on the street with their grandchildren. Here it’s men, not women, who run the vegetable stands and the shops and serve food. 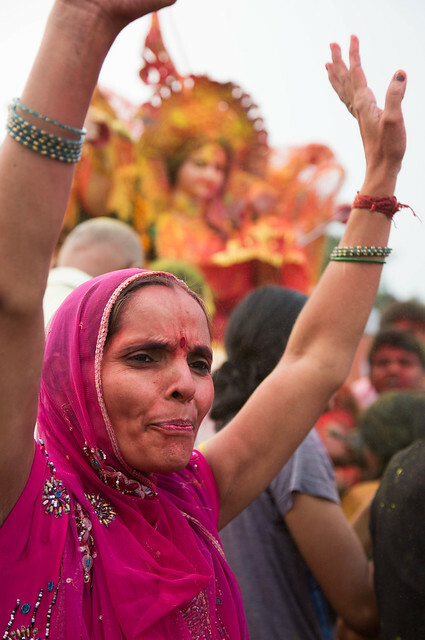 I may see laborers carrying loads of bricks atop their sari-draped heads, cooks shopping for produce at the market, and women waiting for public buses, but we don’t interact. In public, women seem to strive for a sort of anonymous invisibility. It’s safer I think. 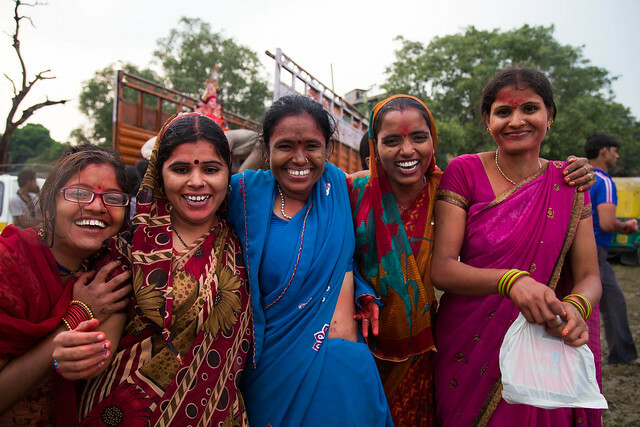 The women I met at the Yamuna though were not striving for invisibility–they were impossible to ignore. 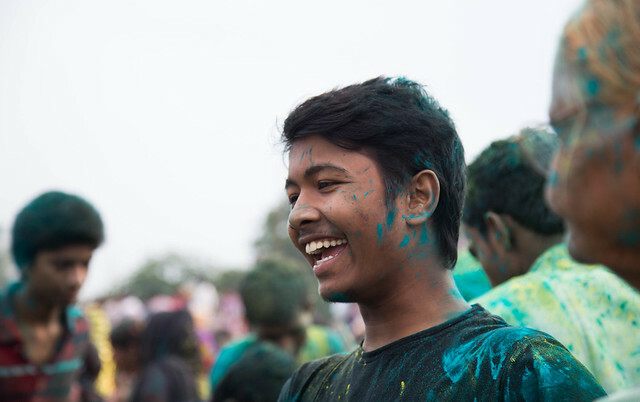 They laughed and sang, smudged colored powder across my cheeks, lead groups in prayerful chants and shook every inch of their bodies as they danced surrounded by a circle of drummers. They were women in their element, boisterous, happy and comfortable in their surroundings. It made me happy just to smile and nod and watch and I could have stayed there for hours drinking in the unexpected joy and intimacy of the scene. 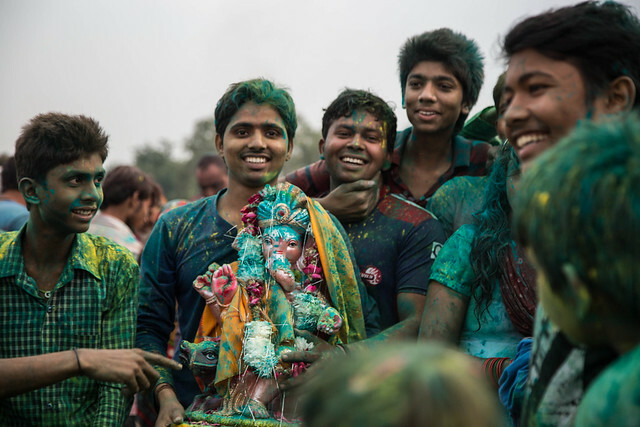 After an hour or so of shooting and smiling and sliding in the mud, I headed home–home to a little boy in need of a bath and a bedtime snuggle and a husband whipping up a quick dinner of fried rice studded with the Chinese sausage and hoisin sauce we hand-carried with us to India. I took an impossibly hot shower and rinsed Yamuna mud and yellow powder down the drain of our American-style bathtub. 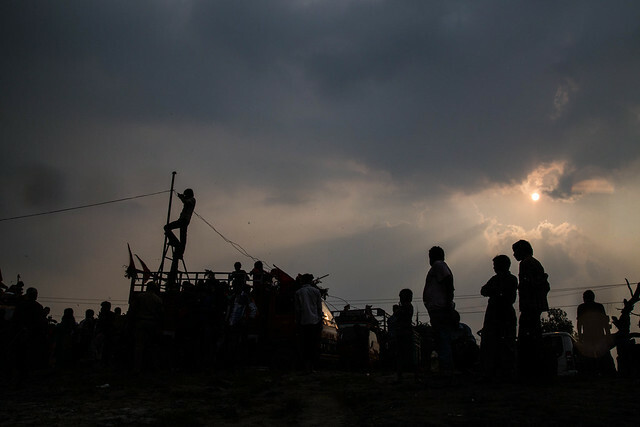 There are some days we spend living in an American bubble surrounded by India and some days we feel as affected by the trials and challenges of this country as everyone else who lives here. And then there are some days where we get to experience the best of both worlds and that I think is what makes this lifestyle so rewarding. Sometimes I love my camera more for the interactions it affords me than the pictures I get out of it. I’d be a terrible photojournalist but, as my friend pointed out, I do make an excellent decoy. While I was busy snapping family photos and turning down opportunities to dance in those hypnotic drum circles, my buddy was able to swoop in unnoticed for some truly beautiful candid shots. I’ll take decoy status any day for another afternoon like yesterday’s at the Yamuna. I think you are right, we often cling to familiarity but this makes us compare our lives with friends and family back home- not always the best or healthiest thing to do. Thanks so much for reading, you are right, the comparisons can definitely take away from happiness in a place! Fantastic post! The pictures are so amazing and completely transported me. Thank you! Wow! Incredible photos Dani!!! Loved every single one! Lovely! I wish wish wish to get the opportunity to go back to India some day soon. The short time I spent there was certainly well ensconced inside the expat bubble, and I’d love to experience it again with the bravery that comes from 8 years in Asia. I know the feeling, I always think about what I would do in China if I went back with a few more years of expat experience under my belt! Newly arrived in Gurgaon and stumbled across your blog. Your writing and photos are an absolute inspiration to me, now a “trailing (and childless) spouse” looking for some purpose other than playing house in my life. 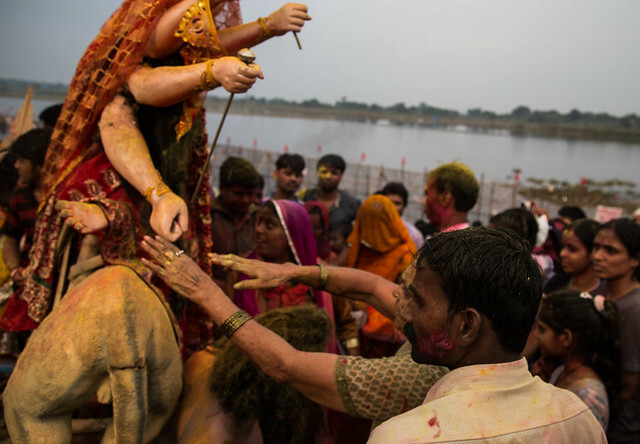 I’ve been here two weeks and struggling with how removed I feel from the India that I came to experience so reading this post of yours has inspired me and given me a little more courage to step out of my comfort zone. Good luck in Italy. Welcome to Delhi Tania (well, Gurgaon!) The trailing spouse gig is hard, it’s something that takes a lot of time and soul-searching to get used to. It’s not that much different than if you too were starting a new job at the same time as your spouse–except even harder because there are no colleagues, no expectations or deliverables to give you purpose in your days and there’s a lot more emotional baggage–especially if you’ve just left your career and your friends and family behind. Plus I think that NOT having kids only makes it harder. You will find your way and your new routines, it just takes time. Getting out of the house is key–even on the days when it feels like the hardest thing in the world to do. It will at least get you out around other people, give you confidence and give you something to tell your spouse about when he or she comes home at night (which matters more than one would think until you are in the position you are in!) Thank you so much for reading!